You are a new driver in Los Angeles, and your task is to join a crew and defend your turf (through high-stakes road races, of course). Fast & Furious Adrenaline is I-Play’s latest Fast & Furious racing game—predictably, the latest in storied franchise is not the most true-to-life racing game out there, but it does offer a more reckless, chaotic experience than your typical racing simulator. 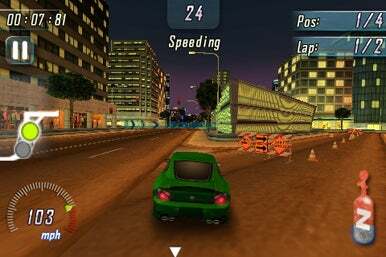 Fast & Furious Adrenaline features three modes (story mode, quick play, and multiplayer) and four different race types (road race, cop chase, time trial, and drag race). The drag race is notable in that it consists of a straight strip and turns off your steering—to win, you have to shift gears manually and use your racing skills to their fullest. Road races, cop chases, and time trials are your basic racing game fare—road races are straight up two-lap races against rivals, cop chases require some skill on your part to avoid being taken out by the police, and time trials count down until each checkpoint. Races are pretty short—they're only two-laps, though the tracks are medium-length. The game features seven car models that you can unlock as you progress through your career. While I-Play’s website says there are 35 cars available, in actuality they're five re-sprayed versions of seven cars. There’s no customization, which is a little disappointing, but each model comes back upgraded and sexier as you get more points. Points gain you levels, which in turn gain you cars—and a nice feature of Fast & Furious Adrenaline is that you don’t necessarily have to be playing story mode to get points. You can also get points from quick play races. Controls are pretty basic—the default is accelerometer steering and automatic gas, but you can also use a steering wheel or “touch steering,” which allows you to steer by touching either side of the screen. Accelerometer control was easy to use, and you can adjust the sensitivity of the accelerometer on the pause menu. While each car has its own specs, handling is pretty much the same across the board. Other buttons on your dashboard include a pause button and, of course, nitrous. You can also brake, by pressing and holding the bottom part of the screen. Multiplayer comes in two modes—local (Bluetooth/WiFi) and online. Online multiplayer is interesting—instead of racing against actual people, you race against other people’s best times (so there are a bunch of ghost cars on the track). The game also integrates Facebook—you can post your successes, as well as videos of your races. Unfortunately, Fast & Furious Adrenaline needs some work if it wants to hold its own against other iPhone racing games. There are several issues—the load time, the graphics, and the fact that the game is just too easy. I was playing on an iPhone 3G, but the load time was just unbearable—sometimes as much as 6 or 7 seconds between screens. It certainly turned me off of playing the game any more than was absolutely necessary. As for the graphics, well, the cars look dated. The use of real car names is not licensed, but they look somewhat like their real-life counterparts (hello, Lamborghini Gallardo). The cut-scenes, though they sometimes froze when I tried to skip them, were also decent. The tracks, on the other hand, were nothing to look twice at—the “Neon City” track looks pretty good, but the rest of the tracks are boring and texture-less. Lastly, Fast & Furious Adrenaline was just too easy—and that’s a lot coming from me, as I’m a notoriously slow-learner when it comes to racing games. None of the cars seem to have any real weight to them, and racing is a lot like pin-balling down the track. This is nice if you, um, routinely crash into walls and/or other cars, but not terribly exciting. Also, despite occasionally crashing into walls and having to wait while my car reversed, I still managed to hit first place in almost every single race. Again, this is nice if you routinely have to turn your car around (and thus fail to win races), but not terribly exciting. Fast & Furious Adrenaline has a cool premise—I enjoyed racing against other crews, “defending” my turf, and running from cops—but as a racing game it’s not much more than having the most recent upgrade and a good eye for when to use nitrous.